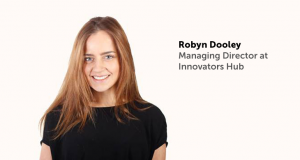 Robyn Dooley is an IOR Ambassador and the Managing Director of Innovators Hub, a creative talent agency connecting young creatives with businesses within the Creative and Digital sector through paid internships. Robyn has been actively involved in creating positive impact and increasing opportunities for young people on a national and international scale. She has served as a Member of the UK Youth Parliament for Knowsley, and is currently a member of the Knowsley Strategic Board for Knowsley Council and sits on the Board of Directors for Knowsley Youth Mutual. Robyn has mentored young women as part of the Big Love Little Sista programme and is a World Merit Fellow having led on global campaigns. She provides business consultancy for a national charity, Young Advisors. Innovators Hub is a creative talent agency founded in 2015 by Robyn Dooley. They work with leading creative, digital and tech companies across the North West, providing only paid internships and freelance opportunities for the next emerging wave of creatives. Their process is tailored and personalised, they spend time with the businesses they work with to help identify the company’s culture and needs, before making any connections. By Robyn Dooley - 18 yr old IOR Ambassador & MD of Innovators Hub, a creative talent agency connecting young creatives to businesses.